“Watch out for that ballistic missile at your 6”. “Fire on that submarine”. Sound fun to you? These are just some of the challenges you’ll face in Air Supremacy ($2.99). This air combat game gets very high marks because it has a ton of game modes. There are several different single player competitions, challenges, there is a campaign mode with several detailed missions, and there are over a dozen multiplayer options. There is a mode for every amount of time, and level of player, and it’s really easy to play. The controls are well-built, and detailed as well. It does fall short in some areas. It’s expensive for one. 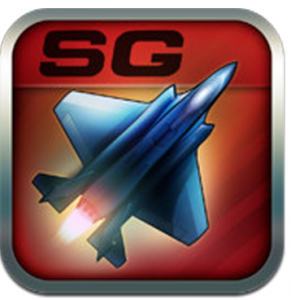 The graphics are nice, but not nearly as detailed as some other iOS air combat games, and the missions are long, but the number of missions is small, meaning that after you get the hang of it, you’ll beat it a little fast for my liking. So is it worth a buy? Obviously. That’s why I’m reviewing it, but it still does leave room for improvement, which is why I’m working hard to find some more games for you guys which I’ll talk more about soon. See yah later!